Though yet to prove itself long-term, smart, off-grid solar-plus-energy storage and mobile money and banking services are shaping up as a potent combination when it comes to providing energy access to the estimated 1 billion-plus people around the world who lack it, as well as opening new vistas of sustainable economic development and empowerment in developing and lesser-developed countries alike. Corporate investment in off-grid energy access companies — primarily those providing smart, mobile pay-go (PAYG) solar and home energy services and products in East Africa — surpassed USD500 million globally in 2018. 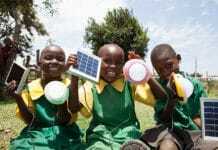 Cumulatively, disclosed corporate investment in off-grid energy access systems and services totaled just shy of USD1.7 billion as of year-end, more like USD2.3 billion–USD2.4 billion when the estimated total value of undisclosed transactions is included, according to a landmark report from Wood Mackenzie Power & Renewables and Energy 4 Impact. Moving beyond the provision of basic, emissions-free electricity, off-grid, mobile pay-go solar home systems are moving up in scale and evolving into platforms for selling and delivering a broad range of services, from energy-efficient lighting, household appliances and devices to banking, financial, Internet and television services, consumer goods and utility water services. Fueling the trend is a diverse group of strategic investors, including independent power producers (IPPs), European utilities, telecommunications and Internet services providers and European oil and gas majors, with varying strategic interests and investment approaches, highlight the authors of Strategic investments in off-grid energy access: Scaling the utility of the future for the last mile. Some 400 million people worldwide gained access to electricity from off-grid solar energy systems from 2010–2017. Nearly 6 in 10 (58%) resided in East Africa and their use of mobile money services has been a key enabler , according to the report. 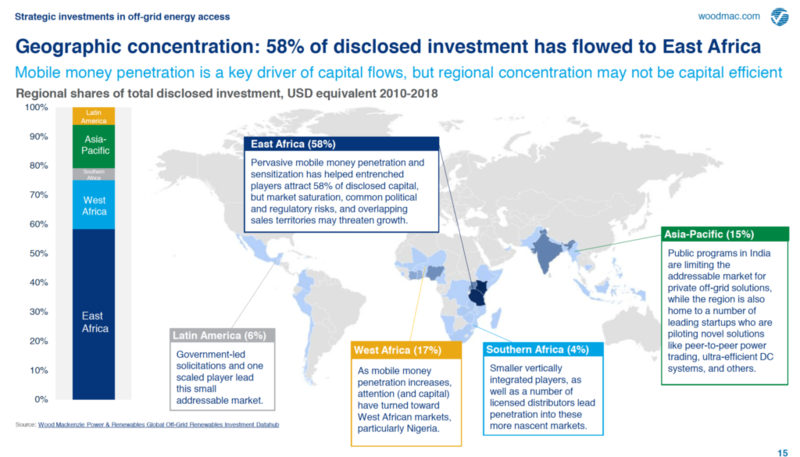 Geographic concentration: 58% of disclosed investment has flowed to East Africa | Click the image to enlarge. Off-grid, low-income, households globally already spend an annual average of USD37 billion for basic energy, highlighting that they’re already paying a disproportionately high percentage of their cash incomes for traditional energy products and services, such as kerosene, charcoal, biomass, paraffin, old car batteries, etc. — that carry a variety of risks and threats to human and environmental health and quality of life. Looking ahead, the research partners expect off-grid solar will provide low- or zero-carbon energy to another 740 million by 2022. Wood Mackenzie and Energy 4 Impact project that the global market for off-grid solar home systems will grow at an 80 percent compound annual growth rate (CAGR) from 2017–2022. 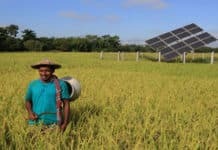 Longer term, they project that off-grid or mini-grid energy systems will account for 71 percent of new electricity connections by 2030 in the countries covered in the report. “Some estimates suggest 71 percent of new electricity connections will come via off-grid or mini-grid solutions by 2030,” Attia noted. “But how this practically plays out is that we’ll see off-grid deployments increasingly dent on-grid power demand growth, particularly where systems and incomes are large enough to support modular system upgrades over time. There’s a nexus here between on-grid and off-grid power demand. However, it’s important not to gloss over the need for large utility-scale generation and grid infrastructure upgrades to meet industrial demand and spur economic development. While this will be increasingly renewable, low-cost, digitally managed, and eventually, demand-following, there is still a massive need for grid-scale power,” he said. Global, off-grid, energy access transaction volume grew 37 percent year-over-year in 2017. The composition of that capital shifted to more than 50 percent debt, a signal that the market continues to scale up and mature, according to the report. Total transaction volumes surged 22 percent higher year-over-year in 2018, with average equity investments doubling and debt investments increasing nearly 5.5 times. Private-sector, strategic investors play a large and pivotal part in driving development and growth of off-grid energy access and solar energy markets and businesses worldwide, but particularly in East Africa. Adding to and building upon the capital foundation and structure of companies active in the market space, strategic corporate investors invest in equity, convertible notes, issue loans and they have recently begun investing in debt securities, though denominated in US dollars. 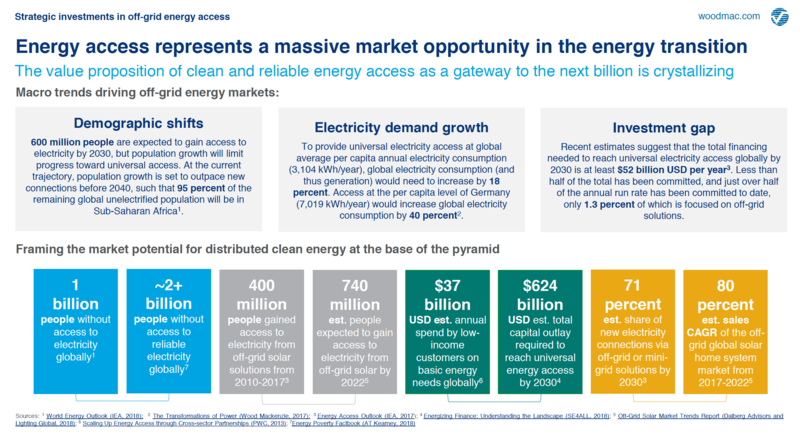 Energy access represents a massive market opportunity in the energy transition | Click the image to enlarge. 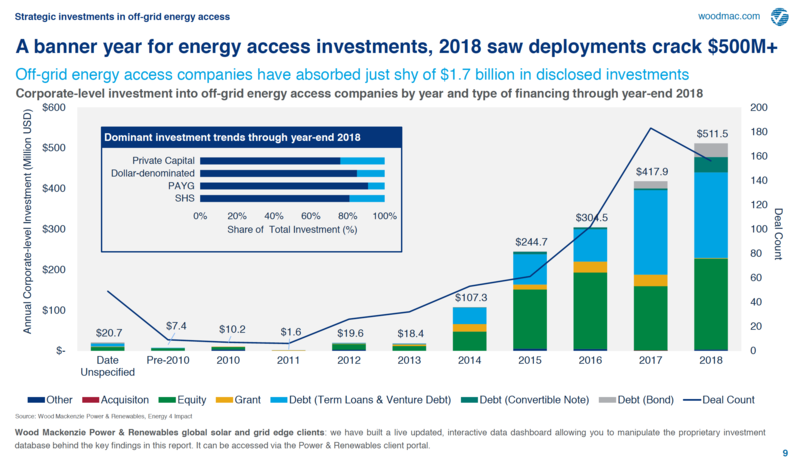 “Strategic investors are playing an increasingly important role in the off-grid sector, attracted by the size and potential growth opportunities in the market. Most of the interest so far has been in pay-as-you-go solar home system companies, although there have also been some notable investments in mini-grids as well,” said Energy 4 Impact Director of Programmes Peter Weston. Weston pointed to French utility and multinational energy services provider Engie’s 2017 acquisition of Fenix International as one of the first successful exits in the sector, a deal that illustrates the market is maturing, he noted. “There is a still a long way to go and it will be important for donors and NGOs, such as Energy 4 Impact, to continue supporting the sector and creating an enabling environment to encourage further investments,” however, he added. 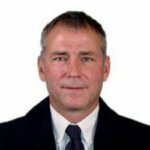 All told, strategic investors have entered into more than 30 partnerships and joint ventures with off-grid energy access companies in nascent markets worldwide, opening up collaborations with a diverse range of technical partners and the potential to leverage internal resources, such as R&D and marketing. Prospects of entering or operating in multiple energy access markets by 2030 serve as a motivation for many of them, the report authors highlight. In addition, strategic investors have made more than USD461 million of indirect energy access and related impact fund investments as of year-end 2018. In terms of volume, most flowed into funds managed or created within the investor’s own corporate structure, allowing them to gain local and regional market experience from a broad set of vendors offering a variety of product lines and at different scales. European utilities, IPPs, and oil and gas majors are looking at creating utilities that fall squarely into the customer-centric (B2C) category, Attia told Solar Magazine. 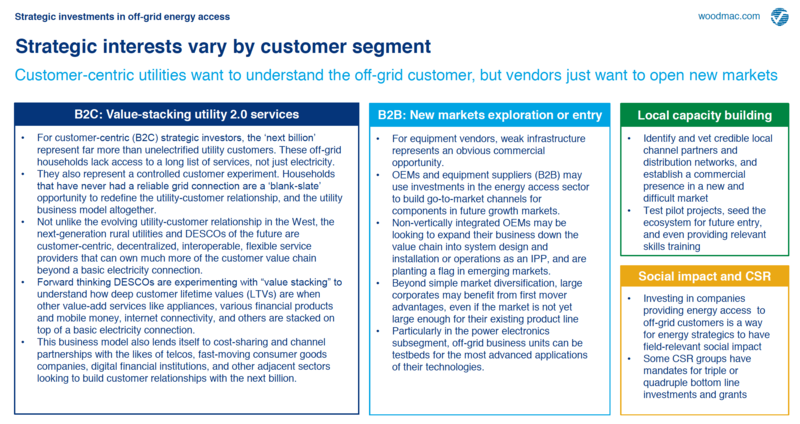 “They are looking to understand how much more customer value they can realistically offer beyond a basic electricity connection by stacking additional value-add services on top of the existing PAYG value chain. Conversely, OEMs [original equipment manufacturers] and other B2B [business-to-business] interests are focused on new market exploration or entry. Less than 25 percent of the activity of strategic investors is non-commercial CSR [corporate social responsibility] or pre-seed activity. That’s to say that over 75 percent is commercially motivated,” Attia said. Strategic interests vary by customer segment | Click the image to enlarge. Heading towards an investment “cliff”? Does the surge in corporate investments in Sub-Saharan African and developing world off-grid solar companies have the making of an investment “bubble”? “It’s not likely a ‘bubble’, but an ‘investment cliff’ could be looming in the short-term future of the sector,” Attia responded. “Investment and risk is highly concentrated in a few highly capitalized companies, some of which may be overvalued, operating in adjacent and overlapping geographies, seeking to meet aggressive growth expectations from VCs [venture capital investment companies], and mostly prioritizing market share over profitability. 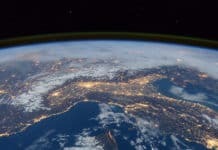 As they start to run up against the limits of their low-cost addressable market, they will continue to face this question of ‘going deep vs going wide,’ where they need to balance growing market share, i.e. acquiring customers, and getting profitable — cutting OPEX, boosting repayment rates, tightening credit requirements, and deepening customer value,” Attia elaborated. Wood Mackenzie highlights that, despite the rapid growth of the last few years, investments in the energy access market space total volumes fall well short of the total estimated financing needed to reach the U.N. Sustainable Development Goal of universal electricity access globally by 2030. “The pace and manner at which electricity is provided to almost 1 billion people who still do not have access to energy will have a dramatic impact on power demand, electricity generation, grid infrastructure investments and future carbon emissions reductions,” Attia highlighted in a news release. A number of obstacles stand in the way of energy access and off-grid solar market and commercial-industrial ecosystem development and growth, as well as associated sustainable development initiatives. Attia offered some potential ways to surmount them. Greater and better coordinated, and blended, investments between private sector investors, government actors, and DFIs [direct foreign investment], etc. Increased strategic participation. In the near term, commercial participation from strategic investors imparts legitimacy to a maturing sector and has been welcomed, but their long-term role or the impact of their involvement is not yet known. Because strategic participation is much broader than equity investments, they can go to market using any avenue they wish. Attia also suggested several possible roles strategic investors might play in spurring development and growth of global off-grid solar, energy access and sustainable development enterprises and initiatives.